Rodgers (knee) was a limited practice participant Wednesday, Michael Cohen of The Athletic reports. Analysis: Having his practice reps capped is status quo for Rodgers, who has toughed out a sprained MCL to rank third in the NFL with 326 passing yards per game while boasting an outstanding 13 touchdowns versus just one interception through seven games. Expect him to ditch his injury designation by week's end as he prepares for Sunday's visit to New England, whose pass defense sits 27th overall (277.3 yards per game) in the league. Rodgers (knee) didn't participate in the open portion of Wednesday's practice, Michael Cohen of The Athletic reports. Analysis: Rodgers is maintaining his practice regimen from past weeks to avoid putting any undue pressure on his left knee. Assuming he upholds that standard, he likely will log a full session Thursday, when the Packers typically put in their most on-field work in a given week. Rodgers completed 18 of 30 pass attempts for 286 yards and a touchdown, adding a five-yard rush during Sunday's 29-27 loss to the Rams. Rodgers (knee) practiced fully Wednesday, Michael Cohen of The Athletic reports. Rodgers (knee) participated in Wednesday's padded practice, Rob Demovsky of ESPN.com reports. Analysis: As the Packers emerged from their bye week, Rodgers upheld his standard of rehabbing his left knee Tuesday, with an expectation that he would practice Wednesday, according to Tom Silverstein of the Milwaukee Journal Sentinel. Rodgers proceeded to do just that, and was even donning a smaller knee brace than normal, per Silverstein. While his level of participation Wednesday is unknown, Rodgers seems to be as healthy as he's been since injuring the knee in the season opener. Rodgers (knee) said he's hopeful to practice in pads Wednesday, Tom Silverstein of the Milwaukee Journal Sentinel reports. Rodgers wasn't seen on the field during the early portion of Tuesday's practice, Ryan Wood of the Green Bay Press-Gazette reports. Rodgers said after Monday's victory over the 49ers that he is hoping to shed his knee brace during the Packers' bye week, according to Tom Pelissero of NFL.com. Analysis: Rodgers will certainly benefit from the Packers' off week, but whether or not he will get rid of the brace will depend on just how much improvement his knee shows in the coming days. Rodgers has still been effective and somewhat mobile despite his injury -- he picked up 34 yards on three runs Monday -- but his play could get even better as he gets back, or at least close, to 100 percent. Rodgers completed 25 of 46 passes for 425 yards and two touchdowns in Monday night's 33-30 win over the 49ers. He also rushed three times for 34 yards. Analysis: Rodgers was locked in Monday night, leading Green Bay to victory on its final drive of the game. In doing so, Rodgers threw for over 400 yards for the second straight game, both of which came without two of his top three wideouts. Now heading into his bye week, Rodgers will hope the time off helps his knee condition improve before facing off with the Rams in Week 8. Rodgers (knee) is officially absent from the Packers' injury report for Monday's matchup with the 49ers, Michael Cohen of The Athletic reports. Analysis: There was originally concern for Rodgers' status after he admitted to suffering a minor setback with his MCL sprain in last week's lost to the Lions. However, he logged a full session at Friday's practice, so this news is relatively unsurprising. Randall Cobb (hamstring) and Geronimo Allison (hamstring) are both considered game-time decisions, so Rodgers could once again be short-handed at receiver. Rodgers (knee) was a full participant in Friday's practice. Analysis: Rodgers suffered a minor setback with his MCL sprain during last week's loss to the Lions and subsequently was held out from Thursday's practice. His return to full participation Friday suggests he should be fine to face the 49ers on Monday, with a chance to get Randall Cobb (hamstring) and Geronimo Allison (hamstring) back in the lineup. Cobb and Allison were limited participants Thursday and Friday. Head coach Mike McCarthy said Rodgers (knee) will practice Friday, Michael Cohen of The Athletic reports. Analysis: McCarthy did not say how involved Rodgers will be Friday, but it appears he will get more work in than he did Thursday, when he was listed as a non-participant. Rodgers (knee) was listed as a non-participant at Thursday's practice, Rob Demovsky of ESPN.com reports. Rodgers (knee) will work in the rehab group with the Packers' other injured players Thursday and is expected to be listed as a non-participant on the team's first practice report of the week, Rob Demovsky of ESPN.com reports. Rodgers said after Sunday's loss to the Lions that his knee is "a little more sore today than the last couple of weeks," Zachary Jacobson of KLGR 1490 AM reports. Rodgers completed 32 of 52 passes for 442 yards with three touchdowns and no interceptions in the Packers' 31-23 loss to the Lions on Sunday. He also three times for 10 yards and lost two fumbles. 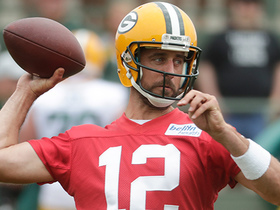 Rodgers (knee) practiced in full Thursday, Tom Silverstein of the Milwaukee Journal Sentinel reports. Rodgers (knee) was held out of Wednesday's practice, Michael Cohen of The Athletic reports. Rodgers (knee) will be limited to working with the Packers' rehab group Wednesday, but it's expected he'll participate in practices Thursday and Saturday, Rob Demovsky of ESPN.com reports. Rodgers completed 22 of 40 passes for 298 yards, a touchdown and an interception in Sunday's 22-0 win over Buffalo. He also rushed five times for 31 yards and lost a fumble. Analysis: Rodgers wasn't at his best, but he didn't have to be with Josh Allen and Buffalo's offense unable to get anything going. 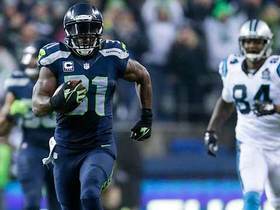 His lone touchdown was a three-yard pass to tight end Jimmy Graham in the first quarter. While he's still operating at less than 100 percent due to a knee injury, Rodgers should be deployed as usual against Detroit in Week 5. Rodgers (knee) is active Sunday against the Bills. Rodgers (knee) is listed as questionable for Sunday's game against the Bills, Michael Cohen of The Athletic reports. Analysis: Rodgers played through a questionable tag the past two weeks, throwing for 546 yards and three touchdowns against the Vikings and Redskins. The bigger concern for Sunday is Randall Cobb (hamstring), who was held out of Friday's practice and now appears truly questionable for Week 4. Head coach Mike McCarthy said Friday morning that Rodgers (knee) took some team reps at Thursday's practice and "looked good" while getting "everything accomplished that we set out to," Rob Demovsky of ESPN.com reports. Rodgers (knee) was a limited practice participant Thursday, Michael Cohen of The Athletic reports. Coach Mike McCarthy said Rodgers (knee) would be a limited participant in practice Thursday, Jim Owczarski of the Milwaukee Journal Sentinel reports. Rodgers (knee) won't practice Wednesday and is still being viewed by head coach Mike McCarthy as day-to-day, Rob Demovsky of ESPN.com reports. 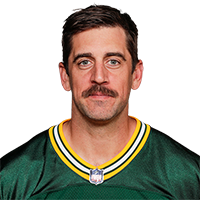 Rodgers (knee) completed 27 of 44 passes for 265 yards with two touchdowns and no interceptions in the Packers' 31-17 loss to the Redskins on Sunday. He also rushed twice for 13 yards. Rodgers (knee) is active for Sunday's game at Washington, Jason Wahlers of the Packers' official site reports. Analysis: Although the Packers never revealed whether Rodgers took part in Saturday's session, he likely did just that for the second week in a row. In his first game on a balky left knee Week 2, he compiled 281 yards and one touchdown against one of the NFL's top defenses, the Vikings, albeit with the help of an overtime period. His mobility was clearly hindered, though, and will be tested further in what will be rainy conditions in Landover, Md. this Sunday. Rodgers (knee) is officially listed as questionable for Sunday's game at Washington, Rob Demovsky of ESPN.com reports. Analysis: Despite the designation, Rodgers is scheduled to practice Saturday and then play in Sunday's game. He followed the same routine last week, missing practice Wednesday, Thursday and Friday ahead of a 29-29 tie with the Vikings. Rodgers didn't have his usual mobility in the contest, but he still managed to throw for 281 yards and a touchdown while playing every snap. He plans to continue playing through a sprained MCL. Head coach Mike McCarthy said Friday morning that Rodgers (knee) will practice Saturday, Jim Owczarski of the Milwaukee Journal Sentinel reports. Analysis: The report notes that Rodgers is going through the same routine he did last week, which indicates he will not practice Friday, but will be listed as questionable and likely play Sunday against the Redskins as long as he is able to make it through Saturday's unofficial practice without issue. Fantasy players hoping to include Rodgers in their lineups for Week 3 will want to pay close attention to his status over the next several days. Analysis: As expected, Rodgers was listed as a non-participant for a second consecutive day, instead rehabbing the MCL sprain and bone bruise in his left knee. Considering his Week 2 performance came on the heels of no practice until Saturday's session, he may merely have to fulfill the same schedule to play in Sunday's game at Washington. Even so, he appears certain to earn a questionable designation for Week 3. Rodgers (knee) will be limited to rehab work during Thursday's practice and is expected to be listed as a non-participant, Michael Cohen of The Athletic reports. Rodgers confirmed Wednesday that his injured left knee could get worse as the season goes on, Rob Demovsky of ESPN.com reports. "Yeah, obviously that's a concern," Rodgers said Wednesday. "Hopefully it goes the other way though." Packers head coach Mike McCarthy said Wednesday that he's still viewing Rodgers (knee) as day-to-day ahead of the team's Week 3 matchup with the Redskins, Rob Demovsky of ESPN.com reports. 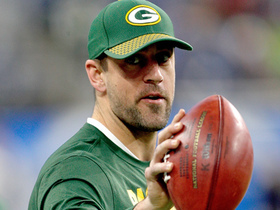 Coach Mike McCarthy termed Rodgers "sore" after Sunday's 29-29 tie with the Vikings, Rob Demovsky of ESPN.com reports. "That's to be expected," McCarthy said. "But he's a warrior, what he gave us yesterday was outstanding. I don't have a read on whether he's better this week than last week." Analysis: Rodgers played through the pain and with a bulky brace on his left knee Sunday, one week removed from the hit that knocked him out of the season opener for a quarter and raised the specter of a potential absence. He nonetheless pushed through, completing 30 of 42 passes for 281 yards and one touchdown against a tough defense. Expect Rodgers' practice reps to be monitored closely this week as he prepares for Sunday's visit to Washington. Rodgers (knee) completed 30 of 42 pass attempts for 281 yards and a touchdown during Sunday's 29-29 tie with the Vikings. He also rushed three times for eight yards. Rodgers is playing through both a deep bone bruise and a sprained MCL and will play with a knee brace on his left knee, Fox's Jay Glazer reports. Analysis: Glazer emphasized that the injuries are worse than initially disclosed by the Packers, that they will likely linger, and that a hard enough hit could cause a setback. Rodgers (knee) is active for Sunday's game versus the Vikings, Jason Wahlers of the Packers' official site reports. Analysis: In the wake of his season-opening left knee injury, Rodgers was a member of the rehab group all week and didn't take the practice field until Saturday. During said session, though, he impressed the team enough to give him the all-clear to play through what Adam Schefter of ESPN called a "compression injury from blunt force while bent." Expect Rodgers' mobility to be compromised, which likely means the Packers will employ a quick-strike game plan to keep him out of harm's way. Rodgers, who is listed as questionable but is expected to start Sunday against the Vikings barring a setback, isn't dealing with any ligament damage to his left knee, but could require up to two months to fully heal, Adam Schefter of ESPN reports. "He has a pretty unusual injury that would keep most people out awhile," a source told Schefter. Barring a setback, Rodgers (knee) will start at quarterback Sunday against Minnesota, sources tell Tom Pelissero of NFL.com. Rodgers (knee) was a participant at Saturday's practice, Rob Demovsky of ESPN.com reports. Analysis: It was the first practice session Rodgers was able to participate in since spraining his knee in last week's season-opening win over the Bears. While his involvement is certainly encouraging, it does not guarantee he will be able to suit up for Sunday's matchup with the Vikings. Still, he appears to be trending in the right direction at this point. Rodgers (knee) didn't practice Friday and is listed as questionable for Sunday's game against Minnesota, Ryan Wood of the Green Bay Press-Gazette reports. Analysis: Rodgers didn't practice in any capacity this week, but both he and coach Mike McCarthy said the quarterback's knee has been feeling better. This could come down to a game-time decision ahead of Sunday's 1 p.m. EDT kickoff, with DeShone Kizer expected to start if Rodgers is ultimately ruled out. Head coach Mike McCarthy said Friday morning that Rodgers (knee) is "getting better" and that "he feels better than he did at the beginning of the week," Jim Owczarski of the Milwaukee Journal Sentinel reports. Analysis: McCarthy's comments don't provide any evidence one way or another in regards to Rodgers' availability for Sunday's game against the Vikings, but it is encouraging to hear Rodgers is progressing in the right direction. McCarthy did add that Saturday's practice will be important for Rodgers, so it could be a day or two until his Week 2 status is ultimately decided. More updates regarding Rodgers' status are sure to come leading up to Sunday's kickoff, but for now, he remains day-to-day. Coach Mike McCarthy called the Week 2 active/inactive decision for Rodgers (knee) "no layup" Thursday, Rob Demovsky of ESPN.com reports. "That's why it's a day-to-day situation," McCarthy said. Packers head coach Mike McCarthy said Rodgers (knee) will be withheld from practice Thursday and instead work with the rehab group, Tom Pelissero of NFL.com reports. Rodgers (knee) won't practice Wednesday and will instead work with the team's rehab group, but Packers head coach Mike McCarthy said that the quarterback isn't dealing with a setback in his recovery, Rob Demovsky of ESPN.com reports. "I would say it's day by day," McCarthy said of Rodgers' status. "Anytime a player comes off a game where he's injured, obvious there's the hope of playing. He'll be given the whole week to get ready." Coach Mike McCarthy said he has some information on Rodgers' knee injury but hasn't yet made a decision on the quarterback's status for Week 2 against the Vikings, Rob Demovsky of ESPN.com reports. "We're still collecting all the information on his specific situation," McCarthy said. "I know Aaron wants to play and is always driven to play but that's all I have right now." Rodgers will have additional tests on his left knee Monday, ESPN's Rob Demovsky reports. "We'll do tests [Monday], and you'll get a better answer Wednesday when I talk," Rodgers said. Rodgers completed 20 of 30 passes for 286 yards with three touchdowns and no interceptions during Sunday's 24-23 victory over the Bears. He also rushed one time for 15 yards. 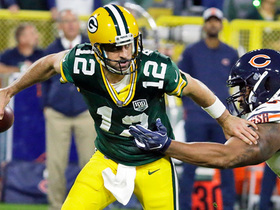 Rodgers (knee) returned to Sunday's game against the Bears after halftime. Analysis: DeShone Kizer committed a pair of turnovers on two drives after Rodgers left the game with a knee injury in the second quarter. The 34-year-old quarterback doesn't appear to have his usual mobility, but he'll at least take a crack at erasing a 20-0 deficit. The Packers may take Rodgers out of the game if they're still trailing by three or more scores in the fourth quarter. Rodgers (knee) is questionable to return to Sunday's game against the Bears, Rob Demovsky of ESPN.com reports. Analysis: Rodgers limped off the field clutching his left leg in the second quarter and was then carted from the medical tent to the locker room. Backup quarterback DeShone Kizer quickly committed a pair of turnovers, leaving the Packers with a 17-0 deficit heading into the break. Rodgers seemingly has a real shot to return, considering he took the field for warmups before the start of the second half, per Demovsky. Rodgers (knee/leg) was carted to the locker room during the second quarter of Sunday's game against the Bears, Adam Schefter of ESPN reports. Analysis: Rodgers limped off the field grabbing at his left knee after he took a sack on third down to end a drive. He was then carted from the medical tent to the locker room, with DeShone Kizer taking over at quarterback for the start of the next series. The Packers haven't made any announcement on Rodgers' availability for the rest of the night. Rodgers limped off the field with an apparent left leg/knee injury in the second quarter of Sunday's game against the Bears, Michael Cohen of The Athletic reports. Analysis: Rodgers grabbed his left leg after a third-down sack, then limped off the field and went into the medical tent. DeShone Kizer will take over at quarterback if Rodgers can't return for the next series. Rodgers and the Packers agreed Wednesday to a four-year, $134 million contract extension, James Jones of The NFL Network reports. 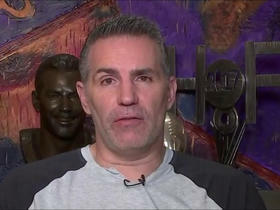 Rodgers (illness), who did not practice Monday, is back at work Tuesday, Rob Demovsky of ESPN.com reports. Analysis: Like many key starters throughout the league, Rodgers isn't in line to play in his team's preseason finale Thursday against the Chiefs. In that contest, look for reserve QB Tim Boyle to garner more snaps than Brett Hundley and DeShone Kizer. Rodgers (illness) did not practice Monday, Pete Dougherty of the Green Bay Press-Gazette reports. Analysis: Rodgers' absence from practice Monday is thus not a major concern, and he'll continue to focus on his preparation for Week 1 action upon his return to the field. Per Tom Silverstein of the Milwaukee Journal Sentinel, Rodgers won't play in Thursday's preseason finale against the Chiefs, a game which will feature Brett Hundley, DeShone Kizer and possibly Tim Boyle. 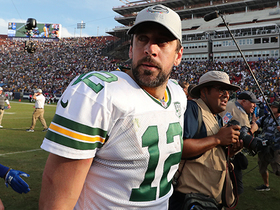 Rodgers won't play in Friday's preseason game at Oakland, Michael Cohen of The Athletic Wisconsin reports. Analysis: As expected, Rodgers won't suit up after logging a series in preseason Week 2 in which he found Jimmy Graham for an eight-yard touchdown. Expect the connection to rev up in advance of the Packers' regular-season opener Sunday, Sept. 9 against the Bears. Rodgers isn't expected to take the field Friday in Oakland, Jason Wilde of ESPN.com reports. Analysis: Rodgers doesn't need the reps after playing one possession in preseason Week 2 against the Steelers. 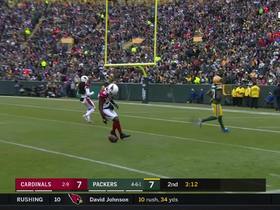 During said contest, he hooked up with Davante Adams for a 27-yard gain before finding Jimmy Graham in the end zone for an eight-yard score. It was as good of a sign as any that Rodgers is up to speed with his likely top two targets in advance of the regular season. Rodgers may not play in Friday's preseason game against the Raiders, Jason Wilde of ESPN.com reports. Rodgers completed two of four passes for 35 yards with a touchdown and no interceptions in the Packers' 51-34 preseason win over the Steelers on Thursday. He also rushed once for five yards. Rodgers is taking reps in the team period of Monday's practice, putting him on track for the start in Thursday's preseason game against Pittsburgh, Michael Cohen of The Athletic Wisconsin reports. Analysis: Rodgers hasn't played in a preseason opener since 2015, typically making his annual debut during the second week of the exhibition schedule. He only played for one series at the same juncture last year, then handled two drives in the third week of the preseason. Training camp is his real opportunity to build chemistry with Jimmy Graham (knee) and the Packers' slew of rookie wideouts. Rodgers is unlikely to play in Thursday's preseason opener against the Titans, ESPN.com's Rob Demovsky reports. 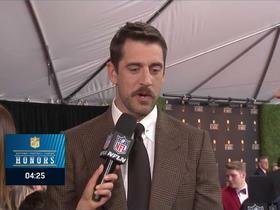 Rodgers hopes to still be playing football when he's 40 years old, Peter King of NBC Sports reports. "I'd love to play to 40," he said. "I just think that number means a lot. Obviously, Tom [Brady] is kind of rewriting the book. Brett [Favre] had a good season when he turned 40. My goal is be able to move like I do or close to how I do and still be able to do that at 40." Rodgers is frustrated with the lack of communication between him and the Packers front office this offseason, Charles Robinson of Yahoo! Sports reports. Head coach Mike McCarthy relayed Wednesday that the Packers' team trainer said "everything looks good" with regard to Rodgers' recovery from Oct. 19 surgery to repair his right collarbone, Tom Pelissero of NFL.com reports. McCarthy said Rodgers would be ready to go for the Packers' offseason program, which begins in April. Rodgers (collarbone) expects to be fully ready for offseason programs in April, the Wisconsin State Journal reports. Analysis: This news was expected since Rodgers hasn't been held back during his personal workouts so far this offseason. Maybe even more importantly, he also felt well enough to play in the Waste Management Phoenix Open Pro-Am this past weekend. The 34-year-old will head into the 2018 season with two years remaining on his current contract. Rodgers (collarbone) stated Wednesday at the Waste Management Phoenix Open Pro-Am that he's "feeling good," Josh Weinfuss of ESPN.com reports. Packers head coach Mike McCarthy said Thursday that Rodgers won't require any further procedures on his surgically-repaired right collarbone, Rob Demovsky of ESPN.com reports. "Aaron's in rest and recovery mode," McCarthy said. "He has a distinct rehab plan as he moves forward." The Packers placed Rodgers (collarbone) on injured reserve Tuesday, ending his season. Head coach Mike McCarthy wouldn't say definitely Monday whether Rodgers will start Saturday's matchup with the Vikings, Ian Rapoport of NFL Network reports. Packers head coach Mike McCarthy said after Sunday's 31-24 loss to the Panthers that he wasn't certain if Rodgers would start at quarterback in the team's final two games of the regular season, Rob Demovsky of ESPN.com reports. Rodgers (collarbone) completed 26 of 45 passes for 290 yards with three touchdowns and three interceptions in Sunday's 31-24 loss to the Panthers. He also rushed six times for 43 yards. Rodgers (collarbone), who was activated from injured reserve Saturday, doesn't have a designation for Sunday's game in Carolina. Analysis: Although the Packers tacked Rodgers onto the injury report Saturday, the lack of a designation is the final bit of information needed to pencil him in as the starting quarterback Sunday. In four career appearances against the Panthers, he's averaged 307.5 passing yards per game and posted a 12:2 TD:INT. Rodgers (collarbone) was added to the 53-man roster Saturday, paving the way for him to start Sunday's game at Carolina, Mike Garafolo of NFL Network reports. Analysis: On Tuesday, Rodgers relayed in a post on his personal Instagram account that he received medical clearance from the team's medical staff to return when first eligible. The development was weeks in the making, as he was seen throwing up to 50 yards before the Packers' Week 12 loss in Pittsburgh and was designated for return Dec. 2. According to Rob Demovsky of ESPN.com, Rodgers will have a designation on the injury report, but there isn't much doubt about his ability to play Sunday. Packers head coach Mike McCarthy confirmed Wednesday that Rodgers (collarbone) would practice this week in preparation for a return to the starting lineup Sunday against the Panthers, Rob Demovsky of ESPN.com reports. Rodgers (collarbone) announced via his Instagram account that he has been medically cleared to play. Analysis: It sounds like Rodgers will be back in practice Wednesday and ready to start this week against Carolina, assuming his right collarbone holds up during Week 15 prep. Rodgers underwent tests on his surgically repaired collarbone Monday morning, but the results are still being reviewed, and a decision on his Week 15 status has not yet been made, Michael Cohen of the Milwaukee Journal Sentinel reports. Rodgers will undergo a CT scan on his surgically repaired right collarbone this week, Ian Rapoport of NFL Network reports. If the scans return negative, Rodgers would gain medical clearance to return from injured reserve and play Week 15 against the Panthers. Rodgers (collarbone) practiced in pads Thursday, Ryan Wood of the Green Bay Press-Gazette reports. Rodgers (collarbone) is slated to serve as the Packers' scout team quarterback in practice this week, Chris Mortensen of ESPN reports. The Packers are hopeful to activate Rodgers (collarbone) from injured reserve when he's first eligible to return Week 15 against the Panthers, Adam Schefter of ESPN reports. Rodgers (collarbone) celebrated his 34th birthday by returning to practice Saturday, Michael Cohen of the Milwaukee Journal Sentinel reports. Analysis: Rodgers is not necessarily considered ahead of schedule in his recovery, rather just progressing in his rehab process. There are still many hurdles for the star quarterback to jump before the medical staff can clear him. While his presence at practice is certainly cause for optimism, he is still not eligible to return from injured reserve until the Packers' Week 15 contest against the Panthers, and the team could still opt to avoid bringing him back if it is out of playoff contention. Rodgers (collarbone) could return to practice Saturday, Ryan Wood of the Green Bay Press-Gazette reports. Rodgers (collarbone) made at least one throw that traveled 50 yards in the air during his brief on-field workout prior to Sunday's game against the Steelers, ESPN.com's Rob Demovsky reports. Rodgers (collarbone) took part in a throwing session prior to Sunday's game at Pittsburgh, Rob Demovsky of ESPN.com reports. Analysis: As mentioned by Demovsky, the session marked Rodgers' first that including visual evidence of throwing. The development comes just days before Rodgers can embark on the final stages of his recovery from a fractured right collarbone. Because he can return from injured reserve as early as Week 15 at Carolina, practice can be added to his regimen this week. Whether he does so or not remains to be seen, but Sunday's activity was a step in the right direction. Packers head coach Mike McCarthy indicated that he was satisfied with how Rodgers (collarbone) looked while doing rehab work off to the side during Wednesday's practice, Rob Demovsky of ESPN.com reports. 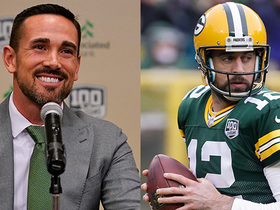 "I think [Rodgers is] making really good progress," McCarthy said Thursday. "I know the training staff and the strength and conditioning staff are very pleased with where he is. He's moving right along." Rodgers (collarbone) fit in some rehab work during the portion of Wednesday's practice open to the media, Rob Demovsky of ESPN.com reports. Rodgers had two plates inserted into his fractured right collarbone during his Oct. 19 surgery, Ian Rapoport of NFL Network reports. While Rapoport notes that it is "theoretically possible" for Rodgers to come off injured reserve in Week 15 or later this season, the Packers "do not expect" him to play again in 2017.